The Cam Kings, a local car club based out of Grants Pass, OR, is a group of older guys who get together every few weeks or so to just hang out and talk cars. A few of the members owned heated garages, so actually working on the classics was a welcomed option. It was always great to get together with that crew when the Rogue Valley froze up! It’s funny how a car nut naturally adapts to the inclement winter months. I remember many a time actually taking parts off my car and bringing them inside the house, much to the chagrin of my wife. “Don’t worry honey, those door panels won’t live in our dining room much longer.” I specifically recall tearing the instrument cluster out of my Buick to restore the gauges. I don’t know how, but doing the bench work on our dining room table seemed like a good idea at the time. I think it was the satin black overspray that left a nice dusty coat on the table and chairs that sunk me on that one. Even as I learned to be extra careful about protecting our furniture and carpets, I couldn’t hide the telltale paint fumes for the life of me. And using a rattle can outside when it’s 30F isn’t a good plan either. What’s a guy to do? I look back on those days fondly now. I may have tested my wife’s patience one too many times, but I (selfishly) was able to keep my classic car hobby alive throughout the winter months. The first warm days of spring were always a relief, especially for her! Well, this is it. 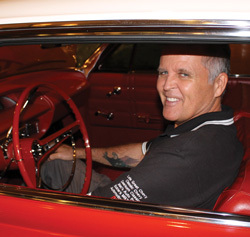 This December issue of Chevy Classics is officially a tribute issue to “60 Years of the ’55 Chevy”. We’ve got some interesting stuff here too – feature cars kick off with Pete Daniele’s “Candied Classic” ’55 Two-Ten – a modified car with just the right amount of modern touches. Next up is a drop-dead gorgeous ’55 Bel Air. This car has been restored to stock condition (with the exception of a couple of small safety items). We’re proud to use this Bel Air in our tribute issue! Our third ’55 feature car is gracing our cover – nothing like Torch Red paint and Ridler wheels to set off a Tri-5. This smokin’ hot Two-Ten takes our poster position this month as well! Other cool ’55 stories include coverage of this past summer’s Tri-5 Nationals in Bowling Green, KY, a tech story on removing and replacing a roof skin, and a Pros in the Know about the 265 V8 – the engine that started it all. We do have a couple of non-’55 items for you. How about a lightly-modified ’69 Camaro RS for our F-Body fans? Check out this sweet machine on page 32. We’ve also got a story on a die-cast car collection starting on page 35. It includes most Chevrolet models, including Tri-5s! It’s too soon to reveal the winners of last month’s “Guess the turkeys” contest. As of this writing, we’ve only had one correct guess (hint: look carefully, they’re hidden pretty well) Keep looking, there’s $25 at stake for the first three winners. And, since this is our December issue, on behalf of Chevy Classics, I’d like to take this opportunity to wish you all a Merry Christmas, Happy Hanukkah, Happy Holidays and a Happy New Year!